REVERSIBLE - Right or Left side! 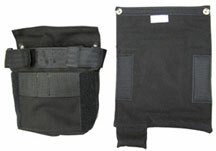 The Escape Systems Carry Bag is an improved and durable design that protects the escape system, but also allows easy access in the event of an emergency deployment. 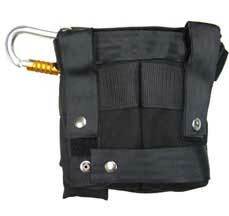 This bag is made of Cordura and strong seatbelt style straps for a secure attachment to your Class II harness. 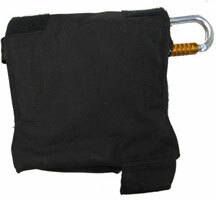 It is black with black reinforcing straps with Velcro and snaps. In 2011, this bag was improved and now comes with a removable top flap. This bag can carry most Escape Systems and components, including the Sterling F4, Petzl EXO and other NFPA-Compliant systems. Dimensions - 7.5" x 7.5" x 2"
The Model 556 Carry Bag is reversible - meaning that it can mount on a firefighters right hip or left hip. * The ideal position and most common is the right hip. All Hands Fire Equipment is an authorized trainer for the Petzl EXO Personal Escape System. 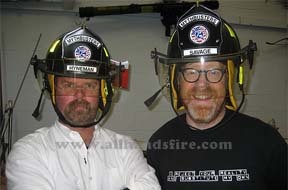 We have trained and supervised THOUSANDS of bailout slides in dozens of fire departments. For more information, please contact us at (888) 681-1009. Bag only, does not include escape kit.